Win a 60-gallon rain barrel hand-painted by local artist James Gallagher!! Tickets are $5/each or 5 for $20... available now and at the Bluebell Festival. 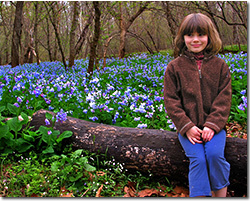 Please join us on Sunday, April 7, to welcome spring, celebrate nature close to home and view the fabulous Virginia Bluebells that carpet the Cedar Run shoreline for nearly a mile. Meet local organizations and people who are working to improve our community. With some of the best Northern Virginia naturalists leading tours and activities, we're looking forward to a special day at an outstanding natural area. Family-friendly and free of charge. PWC Forest Pest Management How do bugs affect forest health? 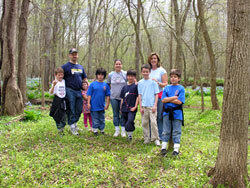 Appropriate attire for Merrimac Farm is always sturdy shoes and long pants, no matter the season. Tuck your pants into your socks to help keeps bugs out. Click HERE to read more about Merrimac Farm.